Reactions in Israel to the attempted arrest of a minor in Nabi Saleh have been fierce yet predictable. Wrapped up in outraged reactions to the treatment of the soldier himself, however, is Israel’s bruised sense of entitlement. An Israeli soldier’s attempted arrest of a Palestinian minor in Nabi Saleh last Friday, and its prevention by the child’s family, have generated heated reactions in Israel. Responses have ranged from outrage at the soldier’s treatment to calls for increased and harsher powers for Israeli security forces . . . Only in a few isolated corners did the question arise of whether it is reasonable or decent for an armed soldier to chase and pin down an injured child. . . .
____ . . . Much was made of the fact that this was not the first time the Tamimi family has been in the news . . . . There seems to have been little consideration of the fact that what is caught on camera simply gives the barest hint as to what goes on behind closed doors, or that the video camera might be a legitimate non-violent weapon in the struggle against military occupation. Israel has created the new position of “security coordinator” for Jerusalem’s Old City area, increasing repression of Palestinian residents in occupied East Jerusalem. ____The Jerusalem municipality established the new position of security coordinator for the occupied East Jerusalem Old City area, which includes the Old City itself and the surrounding Israeli settlements. Creation of this position is the initiative of municipal council member Arieh King, a right-wing activist for the Judaisation of Jerusalem and himself a settler residing in East Jerusalem’s Mount of Olives. ____Israeli soldiers attacked and injured, Wednesday, an elderly Palestinian woman, and kidnapped eight shepherds and farmers, in Salem village, east of the northern West Bank city of Nablus. ____Medical sources in Nablus said an elderly woman, identified as Mahfoutha Eshteyya, 75 years of age, attempted to defend her son as Israeli soldiers were trying to kidnap him, when they violently assaulted her. . . The woman . . . was moved to a local hospital in Nablus. The Palestinian Detainees Committee has reported, Wednesday, that political prisoner Mohammad Jobran Khalil, 33, is suffering various psychological and neurological issues, resulting from being held in solitary confinement for the eight consecutive year. ____The Committee said that Jubran, from the central West Bank city of Ramallah, has also been denied family visits for the ninth consecutive month. The Gaza Strip, ravaged by wars and nearly a decade of a grueling Israeli blockade, could become uninhabitable for residents within just five years, the United Nations development agency said Tuesday. ____“The social, health and security-related ramifications of the high population density and overcrowding are among the factors that may render Gaza unlivable by 2020,” the UN Conference on Trade and Development (UNCTAD) wrote in its annual report. ____Gaza, a tiny enclave of just 362 square kilometers (about 225 square miles) squeezed between Israel, Egypt and the Mediterranean Sea that is home to some 1.8 million Palestinians, counts one of the highest population densities in the world. El-Asmar, Fouzi. THE WIND-DRIVEN REED AND OTHER POEMS. Washington, D.C.: Three Continents Press, 1979. 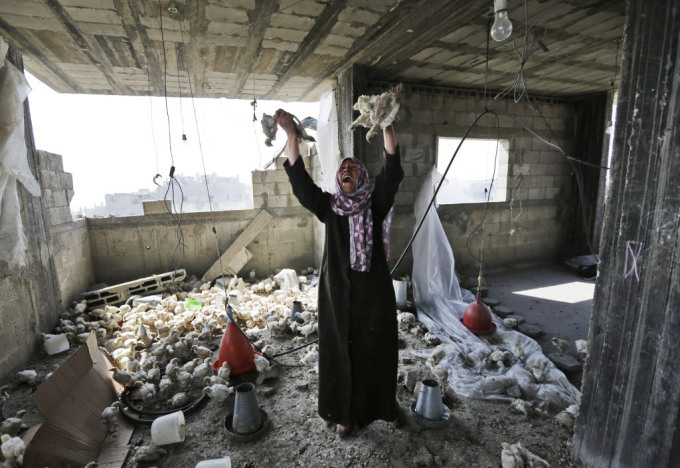 Palestinian Manal Keferna, 30, cries as she holds dead chicks upon her return to the family house destroyed by Israeli strikes in Beit Hanoun, Gaza Strip, Saturday, July 26, 2014. AP Photo/Lefteris Pitarakis.